This tutorial provides you with a foundation for working with Adobe Premiere Pro application preferences. It is the first lesson in the Adobe Premiere Pro CS6 Digital Classroom book. For more Adobe Premiere Pro training options, visit AGI’sPremiere Pro Classes. Application preferences control the overall functionality of Premiere Pro, and you can edit them at any time. The application preferences allow you to change nearly any aspect of the program, from the default length of transitions and still images, to the interface color and the frequency and number of automatic backups made for your projects. In this section, you will configure the auto-save feature to make more copies of your project file at shorter intervals. 1 Choose Edit > Preferences > General (Windows) or Premiere Pro > Preferences > General (Mac OS) to open the Preferences dialog box. 2 From the list of categories on the left, choose Auto Save to view the preferences for how Premiere Pro automatically backs up your files. There are two settings for the application’s Auto Save functionality: Automatically Save Every and Maximum Project Versions. 3 Change the value of the Automatically Save Every property to 10 minutes, and then change the value of Maximum Project Versions to 20 and click OK. This increases the frequency of the Auto Save function, while creating more project versions so you have a greater choice of file back-ups. While most users will admit that auto-save is a great feature, not all can agree on the best frequency for saving files. When the application runs the auto-save command, it can interrupt what you are doing and some users find this quite distracting. The Auto Save function does not save over your project file; instead it creates backups of your project file and saves them to the Adobe Premiere Pro Auto-Save folder. This folder is created automatically by the application and stored in the same location as your original project file. 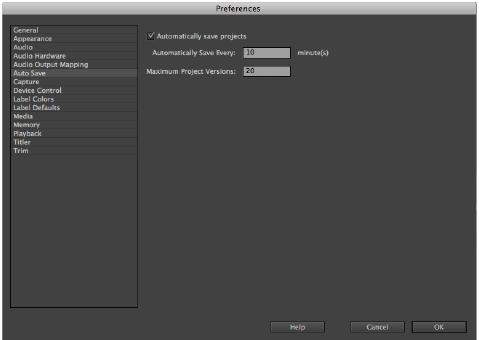 4 Choose File > Save or press Ctrl+S (Windows) or Command+S (Mac OS) to save the project file. Do not close this file; you will need it in the next exercise.